The ancient parish extended 5 km south of the river, and included the town of Newcastle Emlyn. 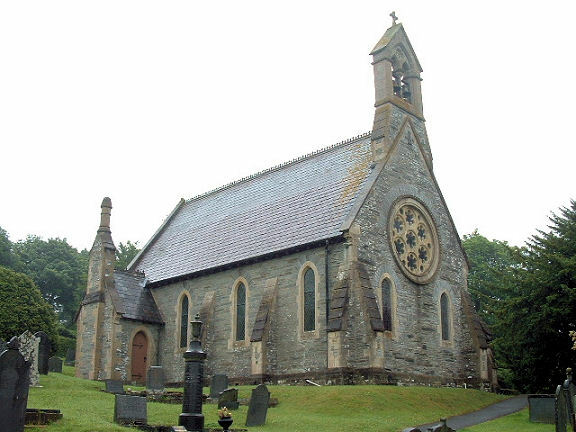 In 1934, it annexed the adjoining parish of Cilrhedyn (Dyfed parish) East Cilrhedyn, and the enlarged parish corresponds with the modern community, which had a population of 1022 in the United Kingdom Census 2001. With the community of Newcastle Emlyn, it makes up the Carmarthenshire electoral ward of Cenarth, which had a population of 1995 in 2001, with 60% Welsh language speakers. The River Teifi at this point emerges from a deep ravine over a ledge that produces a spectacular set of waterfalls when the river is in full flow, and this attracts many visitors throughout the year. Other visitor attractions are a seventeenth century flour mill and coracle museum. The parish church is dedicated to the local Saint, St. Llawddog. Although the present building is relatively modern, is on an important ancient site, and was the "Bishop house" of the cantref of Emlyn. The ancient parish (less Newcastle Emlyn) had an area of 2558 Hectares. Its census populations were: 672 (1801): 897 (1851): 638 (1901). The percentage of Welsh speakers was 98 (1891): 96 (1931). The enlarged parish (post-1934) had an area of 4896 Ha. Its census populations were: 1098 (1951): 1066 (1961): 926 (1971): 971 (1981). The percentage of Welsh speakers was 92 (1951): 91 (1961): 82 (1971): 69 (1981).